Me looking at caller id first: Hello Jeffrey! Jeffrey: We need a cheesy 80's song to encapsulate our argguments, and love and hard times.I just emailed it to you. Listen to it and tell me what you think. Me (after having listened to the song): Close My Eyes Forever by Ozzy Osbourne? Really? Since when do you listen to Ozzy Osbourne? I didn't think you even knew who he was. Crazy. I think my favorite line is the "Like a dagger you stick me in the heart and taste the blood from my blade. And when we sleep would you shelter me in your warm and darkened grave" Have you actually listened to the lyrics? Jeffrey: No. I just wanted a cheesey dramatic 80's song, and thought this one would be perfect. Don't you like it? Me: Actually I do, 80's hair bands are the best! I don't admit it to many people but some Ozzy is good for cleaning or just jamming it out. But not for us. Besides, I think that song is talking about death. It's a little morbid to encapsulate our relationship. Jeffrey: That is why you clean while I am gone and Keith is asleep, right?" Me: Oh, I don't listen to it anymore. That was more from my adolescent years. I still am Loyal to Def Leppard and some Guns 'N Roses when the mood strikes, but I think the mood has only come twice since we have been married. Jeffrey: Well, are there any other songs by him you like? Me: Jeffrey, do you even know who Ozzy Osbourne is? Jeffrey: Yes. I am not as uncultured as you may think. Me: Really? Well then, surprise me. For which group did Ozzy sing before he became a solo singer? Jeffrey: I don't know that. No one knows that. Some Mormon band? This is where I lost it. I couldn't help it. I laughed for a long time. I am laughing as I am relaying all of this to you. My darling innocent husband thought that Ozzy Osbourne was actually Donny Osmond. As if the two names should ever be mentioned in the same sentence! He interrupted my laughter with demands to know why I was laughing, and I had to tell him. My stomach hurt from laughing. 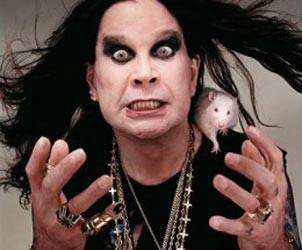 He then told me he had always wondered why people always gave Ozzy such a bad rap. I could almost hear the lightbulb clicking over his head. I will probably be laughing about this for days. oh my goodness! this is one hilarious story. i was also surprised as i was reading it that your hubs wanted an ozzy osbourne song, didn't he think the lyrics a bit dark for a sweet kid like donny?!? Ha ha ha! That is too funny! Ha ha! Not as uncultured as you think...meh heh heh. This made me LOL and get a little rosy cheeked... cause way back when I was 'young'... I got them confused all the time! Darn last name! ROFL!